The best thing, not the only but the best, I can say about graduating with a degree in journalism is . . . well, is I realize I in no way want to be a journalist. Well, OK, clarification: I don’t want to be the guy who interviews 10 people and takes three hours to write a story that’s read all the way through by 2 percent of readers and skimmed by the other 98 percent. I don’t want to be the Who-What-When guy. The guy whose raw materials are rehashed and reworked by columnists and bloggers. The beat writer. Call it arrogance; call it craftsmanship; call it delusional. The passionate chef wants her food to be savored. The consummate optometrist wants everyone to see. And other analogies. I do most of my browsing in the sports section. Having followed sports my entire life, having watched what probably amounts to years of Sportscenter, I’ve developed an intuitive grasp (or feel I’ve developed an intuitive grasp) for the big three. Give me the score, the stats, the key plays, and a funny quote and I’ll do the rest. I don’t want to be told how I should react to a certain game or play. Let me decide. I avoid you, PTI, Around the Horn, Jim Rome, “serious” sports radio, many sports columnists, most sports blogs. I love features, books, columns, films, shows, whatever that contextualize sports: Friday Night Lights, Inning by Inning, Gary Smith, The Fighter, Raging Bull, Tyson, It Never Rains in Tiger Stadium, Bigger Than the Game, Go Tigers!, Gay Talese, all that. I realize it’s not an either or — well, it is in the sense time is finite, and doing something always negates the doing of something else — but, at the same time, I would rather immerse myself in the undercurrent than fret and fight over roster changes and the second-guessing of coaching decisions. I’ll argue and opine amongst friends, but I’m not going to spend bookoodles of time listening or reading or reacting to the arguments of others. I got to typing out some thoughts on Norman Mailer’s The Fight, but everything I typed was muddled and stupid. A total failure. So I’m going to take several hops to the rear and start simple. I like The Fight because it gives a more complete view of one of the best and most interesting heavyweight boxing fights in history. I like The Fight because of Mailer’s voice. I like his prose and his on-page personality. I like how he refers to himself as “the interviewer” or “Norman,” acknowledging the separateness of Norman the writer and Norman the character. I like how he admits to what most critics and readers consider his greatest flaw — narcissism. I like how it’s also his greatest strength. Now, our man of wisdom had a vice. He wrote about himself. Not only would he describe the events he saw, but his own small effect on events. This irritated critics. They spoke of ego trips and the unattractive dimensions of his narcissism. Such criticism did not hurt too much. He had already had a love affair with himself, and it used up a good deal of love. He was no longer so pleased with his presence. His daily reactions bored him. I enjoyed his relationship with Ali. I like how he doesn’t try to hide behind objectivity. He is an Ali fan. He went to Zaire first and foremost to write an article, but he is also there to cheer for an Ali victory. I like how he contrasted the social relevance of both fighters without heavy-handedness. I like how The Fight doesn’t just contextualize The Rumble in the Jungle, it raises the whole experience to art. (I type that last sentence in all earnestness, which is hard for me these days, earnestness. Blame the internet and snarky television.) This is where the split mentioned above returns. Mailer builds the fight into a battle between two forces. He returns repeatedly to the word “n’golo,” which he says is an African word meaning something close to force. Mailer portrays n’golo as always in flux. Foreman, the champion, the favorite, has all the n’golo going into the fight. Many people, experts and not, think Foreman is going to seriously injure Ali. Foreman’s too strong, too fast, too young. Ali is getting older. His training has slowed. Mailer himself frequently references Ali’s pallor and his tendency to get winded before he should. Mailer follows along behind Ali and his retinue with an almost weary resignation. The only person who seems to think Ali can win the fight is Ali. And maybe Angelo Dundee, his cornerman. Mailer’s observation that Dundee loosened the ropes before the fight is one of those small details that frame any great feature. 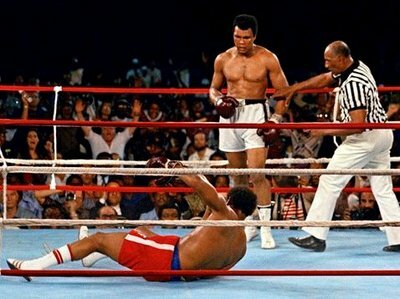 He was all alone in the ring, the Challenger on call for the Champion, the Prince waiting for the Pretender, and unlike other fighters who wilt in the long minutes before the titleholder will appear, Ali seemed to be taking royal pleasure in his undisputed possession of the space. He looked unafraid and almost on the edge of happiness, as if the discipline of having carried himself through the two thousand nights of sleeping without his title after it had been taken from him without ever losing a contest . . . must have been a biblical seven years of trial through which he had come with the crucial part of his honor, his talent, and his desire for greatness still intact, and light came off him at this instant. But of course Ali wins the fight. He “shocks the world.” The whole time leading up to the fight he told George he was going to dance with him. “We’re gonna dance George! Hope you got your dancing shoes George!” But he did the opposite. 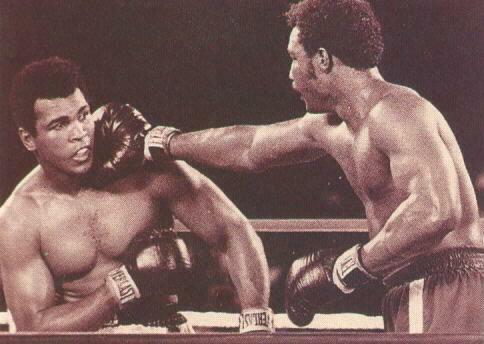 He went to the rope-a-dope and let Foreman punch himself out. George who could punch for days. George who could punch a hole in a man. George the quiet American Olympic champion vs. Ali the loudmouthed Nation of Islam extremist. Brawn vs. brains. Some sucker vs. the Haley Center Haymaker. If you haven’t seen the fight, and if you’ve got 40 minutes, you can watch it in its entirety on Youtube. The split in the first section could’ve been simplified to indicate my preference for long-form pieces vs. the short-term immediate, and the then inevitable commenting on the short-term immediate, and the commenting on the commenting, and on and on. Mailer had the advantage of being in Zaire working on a story, a piece, he wouldn’t have to finish for weeks, maybe months. He had the time and the room to stretch. He got beyond the immediate, the surface details of winner and loser. The Fight is a long profile of Ali, Foreman, and a little Norman preluded by sociological considerations and bookended by great sports writing. 1,500 words condensed to 11: I like that which explains why sports sometime seem real serious. Muhammad Ali was one helluva boxer. And also one of the best at crapping on sportsmanship of all time. For that reason and that reason alone, I could never warm up to Muhammad Ali. And the fact that (1) he made it a point to go out of his way to crap on sportsmanship and (2) he threw away his own Olympic gold medal made his appearance at the 1996 Atlanta Olympics a mockery. Yeah that’s a good point. Given a second chance I would’ve ditched that whole first section and focused more on the sportsmanship issue. Personally, I found his taunting and supposed lack of sportsmanship hilarious, and I think it’s at least partially a part of his strategy. Watch his fight with Foreman and you’ll see him talking the whole time. “Is that all you got George? I thought you hit harder than that George.” And Foreman kept coming at him, when he probably should’ve stayed back and made Ali come to him. The man was a master at getting in the head of his opponent. I’m pretty sure, having read articles on him in the past, that Joe Frazier found Ali referring to him as “The Gorilla” neither clever nor funny. Most (all?) African-Americans rightfully don’t appreciate being compared to primates. But that Ali! What a card, eh? Like I said… Ali = amazing boxer. What I never understand is the hero-worship of a personality I find to be detestable. But, hell, detestable people have been hero-worshipped throughout history, so why do I continue to be surprised? He called Joe “ignorant” and “dumb” multiple times as well. Talk a lot and you’re sure to say some dumb things. Can’t speak for you, but I know my dad and my grandfather disliked Ali for his flashy nature. In their eyes, athletes should be humble, soft-spoken, Godly. The athlete should deflect praise, not reflect it, certainly not spark it. He was arrogant. He was brash. He was not a Christian. Again, should’ve got into that instead of the nonsense I posted above. I love that we have this attitude that an athlete should be Jesus Incarnate. Maybe the problem isn’t those who worship a detestable human being. Rather, it is the desire to worship another person – athlete or not. Personally, I don’t care what an athlete worships, where he worships, or how he worships it. I just like to see athletes show each other mutual respect. It’s called SPORTSMANSHIP. And there’s little enough of it these days on top of glorifying the lack of it. Uh…Hey Beavis. I was talking about the fans who tend to worship athletes – not who an athlete worships. So, you’d be cool with it if you didn’t find the personality detestable? Charles Barkley was right: Athletes are not role models. Hey Butthead, I wasn’t replying to you. Oh, by the way… I am really looking forward to the return of Beavis and Butthead on MTV. I’m gonna go ahead and blame the Internet for the regression. Been trying to mend my trolling ways as of late.